To recognize the critical role of high-quality child care, Child Care Council, Inc. will present its annual Start Bright Impact Awards to honor outstanding family/group family providers, legally exempt providers, child-care center and school-age program staff. Nominations can come from a parent, a child, or from another child care provider or staff member. The awards will be given out at our Start Bright Gala on October 16, 2019. Nominate a child care provider using the form below or download a copy here. Gina Barber, Confidential - Start Bright Impact Awards Committee, Child Care Council, Inc., 595 Blossom Road, Suite 120, Rochester, NY 14610. Nominations must be received by August 31, 2019. Save the Date! 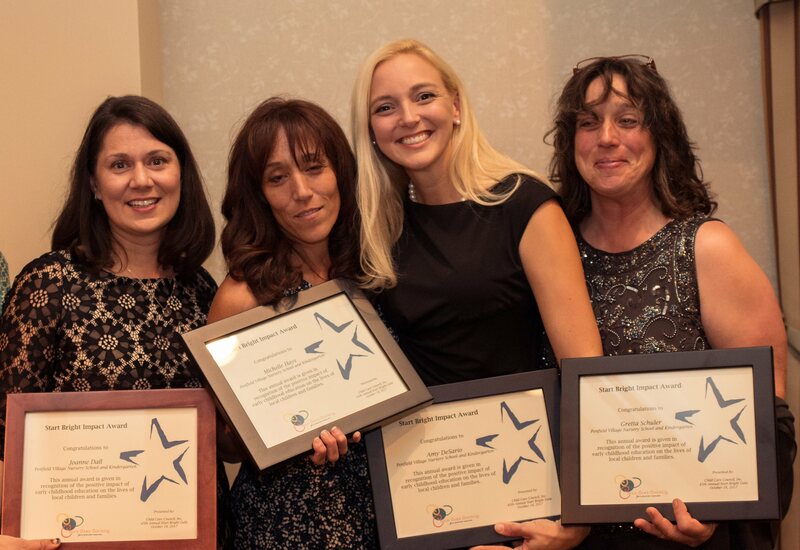 The awards will be presented at the Council’s Start Bright Gala, October 16, 2019 at Locust Hill Country Club, 2000 Jefferson Road in Pittsford. Child Care Council Inc. recently honored child care providers with its annual Start Bright Impact Awards and recognized Rochester Mayor Lovely Warren for her advocacy on child care issues. • Joyce Jackson-Hill from Sistah’s Advantage Daycare in Newark, Wayne County. Her daughter and assistant, Anne Marie Brown, accepted the award on her mother’s behalf. • Cecilia Jackson from Ms C’s Playcare Daycare in Rochester. • Crystal Learn, who provides care in Nunda, Livingston County. Her award was accepted by her daughter, Latisha Learn. • Tiffany Walters from Hankie’s Child Care in Rochester. The Council recognized Mayor Warren as its Distinguished Civic Leader of the Year for being a champion of child care issues on the local, state and national levels. Mayor Warren has advocated for improved salaries for child-care providers, increased availability of child-care services for all sectors of the city and for funding to support low-income working families. Honorees received their awards at Child Care Council’s Start Bright Gala, held at Locust Hill Country Club. The event celebrates the critical importance of early education and high-quality child care in ensuring children get a bright start to the future. In addition to Mayor Warren, other attendees included State Assembly Majority Leader Joe Morelle; State Senator Joe Robach; Corinda Crossdale, Monroe County’s Commissioner of Human Services; and Monroe County Sheriff Todd Baxter. Thank you to everyone who attended or made possible Child Care Council’s Start Bright Gala on Oct. 17, 2018. Held at Locust Hill Country Club, the event celebrated the importance of high-quality child care and early education in ensuring children get a bright start to the future. The Council also recognized Rochester Mayor Lovely A. Warren as its Distinguished Civic Leader of the Year for being a champion of child care issues on the local, state and national levels. Gala proceeds benefit the Council’s Start Bright scholarship program, which supports the Council’s early childhood quality enhancement programs for providers and staff. The U.S. Food and Drug Administration (FDA) is warning that over-the-counter (OTC) oral drug products containing benzocaine should not be used to treat infants and children younger than 2 years. The risk of a serious and potentially fatal blood disorder prompted FDA action on OTC oral benzocaine products used for teething and mouth pain and prescription local anesthetics. 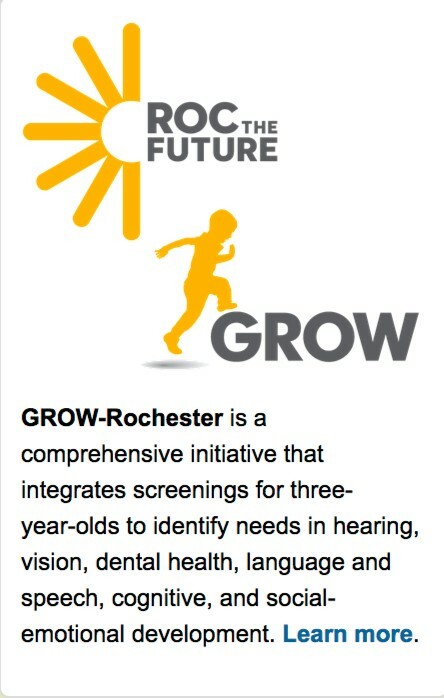 Child Care Council was recently featured on News10NBC’s Rochester in Focus show. You can see the show here. Child Care Council Inc. CEO Barbara-Ann Mattle has been recognized with a statewide award from the Family Child Care Association of New York State (FCCANYS). 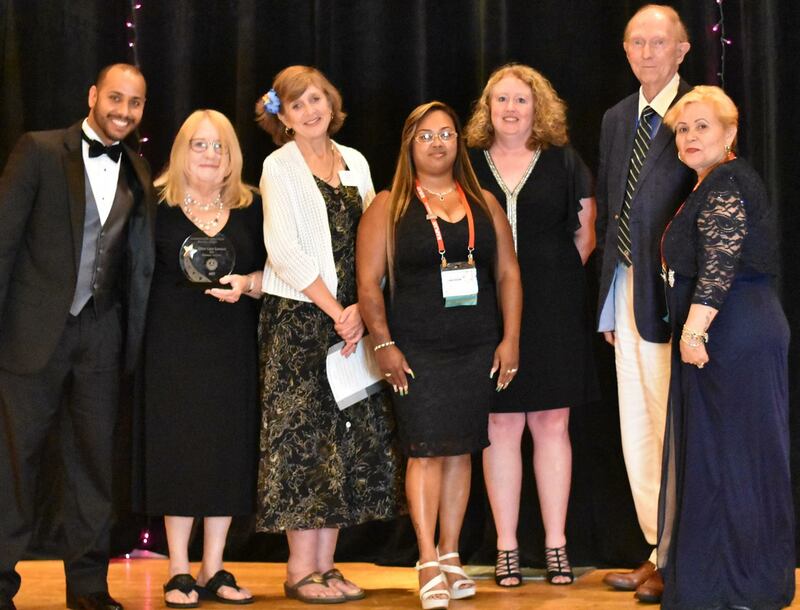 At the recent FCCANYS annual conference, Mattle was honored with the 2018 Friend of Family Child Care Award. 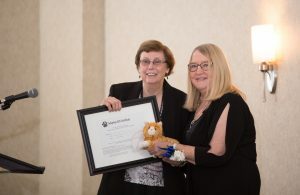 She received the award in recognition of her 34 years of supporting family child care development and of her work to enhance the quality of family child care, both locally and nationally. The award also highlighted the numerous educational-program presentations Mattle has given at the association’s annual conferences. A business leader and a long-time volunteer were recently honored with awards from Child Care Council Inc. 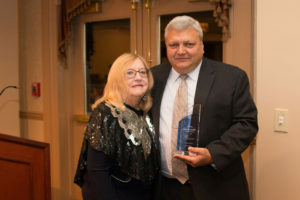 The Council presented its business leader of the year and volunteer of the year awards at its annual Start Bright Gala, held at Locust Hill Country Club. 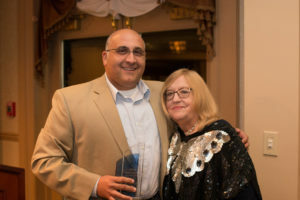 Fausto Prattico, principal of Lavoro Group, was recognized as the business leader of the year. The Council cited his efforts to increase awareness of the value of early childhood education, through direct marketing to his business clients’ employees. His company also is the major sponsor every year of the Council’s Start Bright Gala. Mike Kramer was honored with the volunteer of the year award. Kramer, the Council’s longest-serving volunteer, was recognized for training child care providers in budgeting and taxes, for his previous service on the board of directors, and for donating numerous items for raffles and auctions at the gala. Child Care Council’s Start Bright Gala celebrates the critical importance of early education and high-quality child care in ensuring children get a bright start to the future. This year’s gala also highlighted the Council’s 45th anniversary. More than 40 million Kidde fire extinguishers with plastic handles have been recalled due to a failure to discharge. For more details, including model numbers, see the Consumer Product Safety Commission notice. 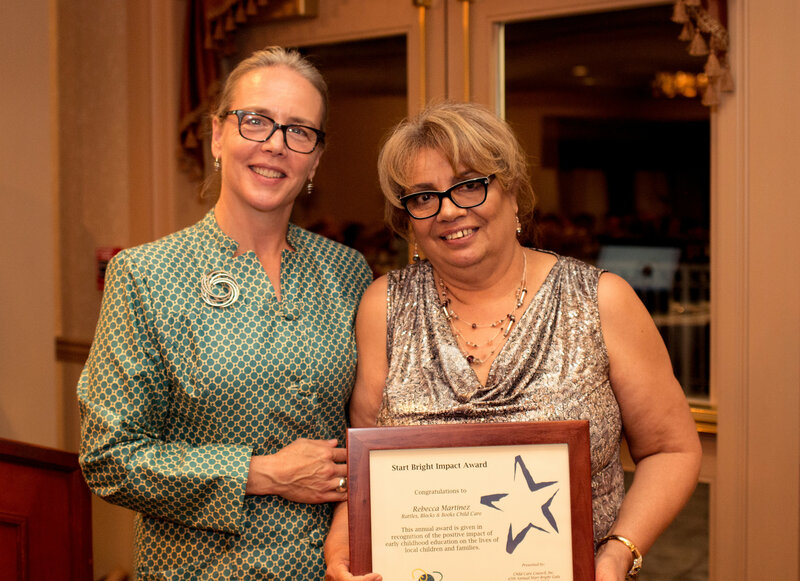 Child Care Council Inc., a nonprofit that connects families with quality child care, recently honored child care providers with its annual Start Bright Impact Awards for exemplifying the critical roles that high-quality child care and early education play in the lives of young people. 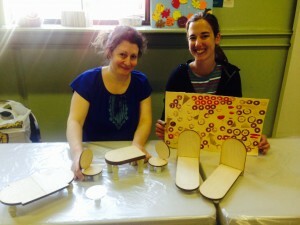 – Rebecca Martinez from Rattles, Blocks and Books Daycare in Rochester. Martinez was recognized for her work in early childhood and adolescent development. – Nancy Neuroth of Little Monkey Shines in Penfield. A provider for more than 50 years, Neuroth was cited for her work to give educational lessons and for a preschool curriculum with nursery rhymes, letter recognition, letter writing, printing, and counting. See the flyer for more information: Child Care Council OrKIDstra Flyer 17-18 – Updated. 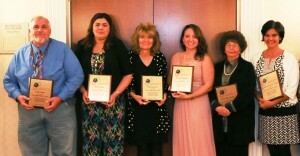 Child Care Council Inc.’s work to support child care providers has been recognized with a national award. 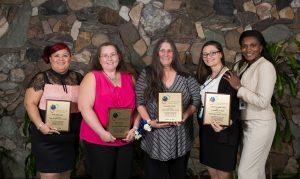 The National Association for Family Child Care (NAFCC) recently presented its Accreditation Facilitation Project of the Year award to the Council for its success in helping nine Latino child care providers to earn their Child Development Associate degree and in developing high quality programs that have earned them NAFCC accreditation. The program’s results actually increased the number of accredited family child care providers in Rochester by 900 percent. The program has now been expanded to include family child care providers from throughout our community. “This award recognizes Child Care Council for the success of this project, but it also highlights the heart displayed by Council leadership and staff to have a positive impact on providers’ lives,” said Dawn Cramer, accreditation operations manager, NAFCC. 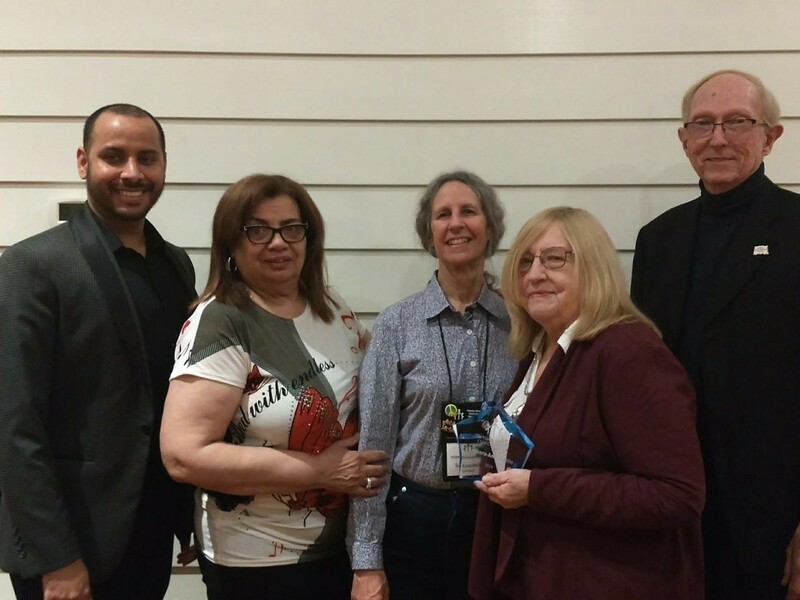 Pictured (from left to right): Hector Santiago; Council CEO Barbara-Ann Mattle; Linda Schumacher, NAFCC accreditation council chair; provider Carmen Gonzalez; Lynne Fisher; Ed Maier; and provider Juanita Sanchez. Child Care Council Inc. is introducing a new program to give away free books to children of all ages. – Children visiting Council offices can take a free book home. In the Rochester office (595 Blossom Road, Suite 120), the books are located in the front office reception area, in the consultation/computer room, and in the Kid Zone in the Repurpose and More Store. The Rochester Public Library is donating books for the program, and it has donated more than 2,000 books to date. Each book includes a Books 4 Fun program sticker with a space for each child to write his or her name as the owner of the book. The Council also is accepting donations of new or gently used children’s books at all its offices. The Books 4 Fun program is kicking off first in Rochester and Monroe County, and it will be extended to the Council’s Livingston County (Lakeville) and Wayne County (Newark) branch offices over time. This program builds off the Council’s existing My First Library, which was established in 2001 with financial support from Council volunteer and supporter Joan Frazier. Frazier has been instrumental in working with Council staff to plan and coordinate the Books 4 Fun program as well. Each summer, the City of Rochester in partnership with the Rochester City School District and Food Link provide free breakfast and lunch to city youth 18 years and under through the U.S. Department of Agriculture’s Summer Food Service Program. Meals are at many city sites, Monday through Friday, June 27 to August 26, except July 3. Sites include community agencies, schools, churches and the Recreation Centers. Breakfast is served at 8:30 – 9:30 a.m., Lunch at 12:00-1:00 p.m.
Child Care Council has been selected to receive a Community Health Award from Excellus BlueCross BlueShield. The award will help fund the Council’s Asthma Friendly Child Care Endorsement initiative, which trains child care programs in Monroe, Wayne and Livingston counties on ways to safely provide care to children with asthma. 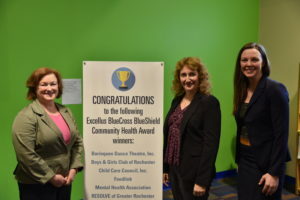 Child Care Council is one of nine Monroe County-based nonprofits chosen from among 200 applications to receive an Excellus BCBS Community Health Award. The awards were announced during a news conference on April 20, 2017. If you are a New York State registered nurse and looking for a new career, please see our latest job posting! Please join Child Care Council at the 45th Anniversary Start Bright Gala, which celebrates the importance of early education and high-quality child care in ensuring children get a bright start to their future. “Too many families here in Monroe, Livingston and Wayne counties struggle to gain access to affordable child care. Some parents are forced to leave their jobs because they cannot afford the high cost of care. Unstable child care arrangements also place a heavy burden on employees and on employers, due to increased absenteeism and decreased productivity. “Thankfully, Governor Andrew Cuomo is committed to making child care more stable and more accessible for families across the state. As the local nonprofit agency working to improve child care access and quality, Child Care Council Inc. applauds Governor Cuomo for his budget proposal to increase the child care tax credit for middle class families. This measure will make a dramatic difference in the lives of thousands of children and families, by making child care more affordable and more accessible. Child Care Council Inc. recently honored four child care programs with its annual Start Bright Impact Awards for exemplifying the critical roles that high-quality child care and early education play in the lives of young people. – Mary Deary, lead teacher at Brockport Child Development Center. She was recognized for providing activities designed with a child’s development in mind, such as art activities, spring flower planting, treasure hunting, working on table manners and coordination skills, and book reading. – Cynthia Evans, a legally exempt provider in Greece, N.Y. Cynthia Evans was nominated for the care she gives the children of a single mother. The children are her sister’s grandchildren – her sister recently passed away, and watching them was a promise Cynthia Evans made to her sister. – Irma Oquendo, a family child care provider offering a Spanish-speaking program in the city of Rochester, N.Y. Nominated by seven people, Irma Oquendo was described as being professional and prepared, with a real passion for her job. Irma Oquendo recently earned her Child Development Associate (CDA) credential, as well as accreditation from the National Association for Family Child Care (NAFCC). – TLFC Child Care and Learning Center in Brockport, N.Y. TLFC was recognized for offering an innovative intergenerational program that combines child care with an elder-day program; for supplying everything parents need, such as diapers, wipes, formula, and food; and for partnering with Kirby Farms to provide locally grown produce. 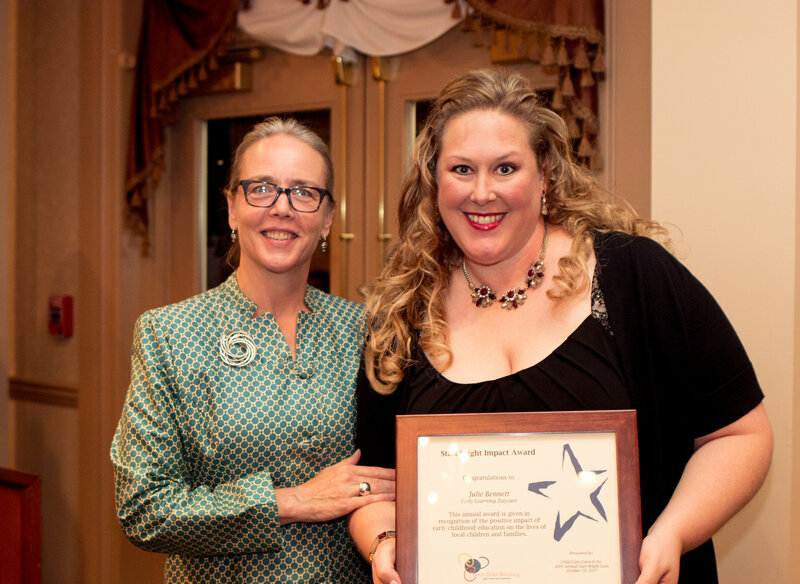 Samantha Hooper, TLFC’s intergeneration program director, accepted the award on behalf of the center. Honorees received their awards at Child Care Council’s Start Bright Gala, held at the RIT Inn and Conference Center in Henrietta, N.Y. The event celebrates the critical importance of early education and high-quality child care in ensuring children get a bright start to the future. Joan Frazier was honored recently with the Small Business Leader Award from Child Care Council Inc.
Frazier was recognized for her dedication to high-quality child care and for her generous support of Child Care Council. Her support includes funding the creation of My First Library at the Council in 2001; getting the Wallpaper Guild to donate wallpapering materials and installation for Council walls and for a new conference room; volunteering at the Repurpose & More Store; funding the Council’s October Family Engagement Conference; and providing an ongoing grant for innovative program support. Joan Frazier owned and operated Wall Expressions, a small business specializing in residential wallpapering and painting, for 27 years until her recent retirement. A former program director for the Girl Scouts of Genesee Valley, Joan Frazier resides in Irondequoit. The award was presented at Child Care Council’s Start Bright Gala, which celebrates the importance of early education and high-quality child care in ensuring children get a bright start to the future. New York is participating in an early childhood professional development opportunity designed to support the social and emotional development of children birth through five. 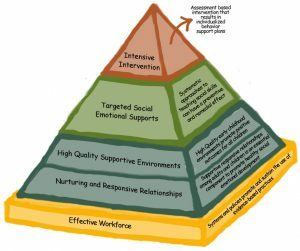 The Center on the Social and Emotional Foundations for Early Learning (CSEFEL) has developed a conceptual framework of evidence-based practices for promoting young children’s social and emotional competence and for preventing and addressing challenging behavior. The Pyramid Model includes extensive training materials, videos, and print resources to help New York’s programs and providers implement the model. The modules are appropriate for professional development of providers, administrators, and teachers/caregivers who work with infants, toddlers and preschoolers (aged birth – 5 years of age). Each module is a whole day training (6-7 hours) although modules can be broken up into shorter training over a period of several days if preferred. Modules should be completed in order as concepts built upon each other. Posted in Uncategorized | Comments Off on What is the Pyramid Model? Child Care Council Inc., a nonprofit agency working to improve child care quality, announced today that a recent donation from the Monroe County Democratic Committee will support first aid and CPR provider training. Last month, the Monroe County Democratic Committee announced it will donate $5,250 to the Council. The Council’s board of directors and management team has decided to put these funds toward first aid and CPR training for enrolled legally exempt providers who serve low-income working families. This enhanced training is currently not required for legally exempt providers. The first aid and CPR training is expected to begin in early summer. Six art teachers from the Webster School District recently visited the Council’s Repurpose & More Store – and made some crafty items from the items they purchased. Child Care Council Inc. has been awarded $68,000 in annual grant funding for up to five years from the New York State Office for People With Developmental Disabilities to provide a behavior support program in child care settings in Monroe and Wayne counties. These grant funds enable Child Care Council to serve children with developmental disabilities who are exhibiting challenging behavior that may affect their placement in a licensed, registered or legally exempt child care program. The Council will provide free, on-site, intensive technical assistance to help implement positive behavior strategies and to increase provider understanding of a child’s behavioral needs. In addition, the Council will work with providers to develop customized plans that will benefit the child and enhance their positive experience in child care. Providers can benefit from up to 15 hours of technical assistance per child. Mattle noted that this latest grant funding also expands on the special-needs services currently provided by the Council, such as free, enhanced child care referrals to parents who have a child with a developmental disability. As part of the grant, Child Care Council also is offering a behavioral training series to inform providers about special-education laws and how to assist the families they serve. The three-part class series will cover 1) how the Americans with Disabilities Act pertains to a provider’s program when working with children with disabilities; 2) research-based intervention strategies to address challenging behaviors; and 3) how to identify the differences between a “meltdown” and a tantrum. -Rochester: March 12 and 19, from 9:00 a.m. to 1:00 p.m.
-Rochester: May 23 and 25, and June 1, from 6:30 to 9:00 p.m.
-Newark, Wayne County: June 13, 20 and 27, from 6:30 to 9:00 p.m. While the technical assistance is available to providers at no charge, a fee of $30 is required for the class series. For more information about the training series or about the behavior support program, child care providers can contact Kristen Torkelsen, special needs advisor at Child Care Council, at 585.654.1224 or at [email protected]. Child Care Council Inc. has been chosen as one of only 10 sites across the country to participate in a healthy child brain development project. Child Care Aware® of America selected the Council as part of a national network of communities and organizations activating Vroom, a Bezos Family Foundation initiative that is helping parents nationwide promote brain development in children from birth to five years old. Child Care Council and other participating sites – part of Child Care Aware of America’s nationwide Child Care Resource and Referral (CCR&R) network – will use Vroom to bolster its current work with families. Vroom provides interactive tools and resources that highlight the science behind early brain development, showing parents how they can turn activities like bath time and mealtime into opportunities that build their children’s brains. This partnership is particularly exciting in its ability to facilitate a far-reaching culture shift − one that begins with parents understanding early brain development and extends into how families, providers, businesses, and communities all work to support brain development during the first five years of life. Other sites selected for Vroom include: Childcare Resources Birmingham (Alabama); Child Care Aware® of West Central Arkansas; Child Care Resource Center (California); Florida Office of Early Learning; Child Care Resources Inc. (Montana); Southern New Hampshire Services Child Care Resource and Referral; Capital District Child Care Coordinating Council Inc. (Albany); Child Care Connection, a program of Info Line Inc. (Ohio); and Corporation of Ohio Appalachian Development. About Child Care Council Inc.
Child Care Council Inc. (childcarecouncil.com) is a comprehensive parent-referral, adult-education and community-resource agency working to improve the quality of child care. A Child Care Aware® Quality Assured agency, the Council provides information, training and resources to child care providers and parents in Monroe, Livingston and Wayne counties. The non-profit agency offers coordinated services to support child care programs, including a professional library, referral services, free notary public, fingerprinting waivers, reduced-cost business services, and a resource/recycle shop (Repurpose & More Store). Child Care Aware of America is our nation’s leading voice for child care. We work with state and local Child Care Resource and Referral agencies (CCR&Rs) and other community partners to ensure that all families have access to quality, affordable child care. To achieve our mission, we lead projects that increase the quality and availability of child care, offer comprehensive training to child care professionals, undertake research, and advocate for child care policies that improve the lives of children and families. To learn more, visit usa.childcareaware.org. Follow us on Twitter @USAChildcare and on Facebook at facebook.com/usachildcare. There are several positions open at our agency. For current postings, please click here. Child Care Council Inc. is partnering with Girl Scouts of Western New York to offer a nationally recognized babysitting course as a Girl Scout program. Girl Scouts of Western New York approved the Safe Sitter® babysitting training as part of its program offerings. Child Care Council, a registered Safe Sitter teaching site, will provide the training and structure it to meet the needs of individual troops. Designed for young teens and adolescents ages 11 and older, Safe Sitter prepares graduates to handle emergencies when caring for younger children and equips them with the tools needed to stay home alone safely. Safe Sitter aims to reduce the number of avoidable and unintentional deaths among children being cared for by young teen babysitters, by learning infant and child choking rescue, American Heart Association standards for rescue skills, and first-aid techniques from the American Academy of Pediatrics. For more information about the program, Girl Scout troops can contact Linda Lane, Safe Sitter site coordinator at Child Care Council at 585.654.1223 or at [email protected]. the cost of child care across the country. Download or view a copy of the report. Child Care Council Inc. recently honored six child care providers with its annual Start Bright Impact Awards for exemplifying the critical role that high-quality child care plays in the lives of young people. 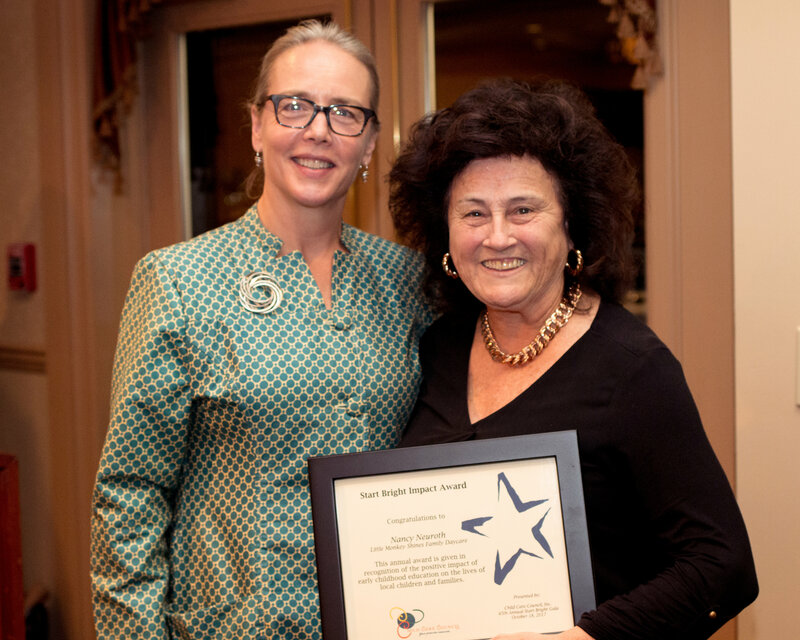 – Lifetime Achievement Award: Patricia Pucci, from Faith Child Care and Nursery School in Penfield, N.Y. Patricia Pucci has worked with children for more than 30 years, and she has been at Faith Child Care for 25 of those years. – Center Award: Friendship Children’s Center in Rochester, N.Y. Friendship was nominated for the award for being neighborhood oriented and for providing a healthy atmosphere where children enjoy learning and playing. The award was accepted by executive director Joi DiGennaro-McMurtry. – School Age Award: Ivan Green YMCA in Irondequoit, N.Y., accepted by site coordinator Mary Ann Pezzulo. Ivan Green YMCA was nominated for providing a safe environment and for caring for an increasingly diverse child population. – Group Family Daycare Award: Jessica Mensing, from Nanny’s Place Daycare in Greece, N.Y. Jessica Mensing, who was cared for by Nanny’s Place Daycare as a child, has served as an assistant provider there for four years. – Family Daycare Award: Rhina Duval of Rochester, N.Y. Rhina Duval was nominated for her work to engage children in activities and for going above and beyond for the children in her care. – Center Staff Award: Chris Smith, from Creative Environment Learning Center in Macedon, N.Y. Chris Smith was nominated for the care he provides to children with special needs. Honorees were recognized at the Council’s Start Bright Gala, held at the RIT Inn and Conference Center in Henrietta. Nancy Kaplan, coordinator of Rochester’s Child, a Rochester Area Community Foundation initiative, has received the 2015 Child Care Champion Award from Child Care Council Inc.
Kaplan was recognized for her creative leadership in support of early childhood education in the greater Rochester community. The award was presented at Child Care Council’s Start Bright Gala, Oct. 21, 2015, at the RIT Inn & Conference Center. In her role at Rochester’s Child, Nancy Kaplan assists in raising approximately $50,000 annually and a $2.5 million endowment that supports about $100,000 of the initiative’s yearly grants. Active in the community, Nancy Kaplan is a member of the Early Childhood Development Initiative (ECDI), a collaboration of more than 20 providers, programs, funders, community leaders and experts. She currently serves as chair of ECDI’s Parent Engagement Committee and on the organization’s Leadership Cabinet and Advocacy Committee. She resides in Rush, N.Y. Please take a few minutes if you have not done so already to complete our newest Training and Technical Assistance survey. This is designed for child care providers to help us understand how to best meet your training and TA needs. If you choose to share your name and contact information you will be eligible for a drawing for a free 2.5 hour class of your choice. Thank you for your help. Sesame Workshop and Child Care Aware® of America are partnering with Child Care Council Inc. to launch a community outreach effort to build resilience and self-esteem among young children. The Council is offering free toolkits with activities and positive routines to help parents, caregivers and educators foster young children’s resilience. The bilingual (English and Spanish), multimedia toolkits are composed of a Sesame Street DVD featuring a Muppet story and music videos with real children and families; a family guide with tips and strategies for dealing with grieving, incarceration and divorce; a community guide for child care, nursery school and other programs working with children; and links to additional materials online. 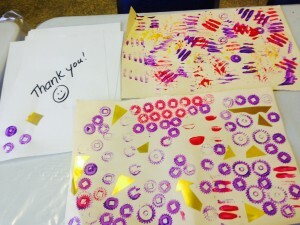 The free toolkits currently are available at Child Care Council’s offices in Monroe County (595 Blossom Road, Suite 120 in Rochester), Livingston County (3513 Thomas Drive, Suite 4, in Lakeville), or Wayne County (510 West Union Street, Suite 1, in Newark). People also can request a toolkit by contacting Renee Sholz, the Council’s referral services director, at [email protected] or 585.654.1286. The Office of Children and Family Services (OCFS) is pleased to announce that its review of public comment on the day care center, school age child care and small day care center regulations is complete. The new regulations were adopted on November 19, 2014 and are effective on June 1, 2015. This six month lag period was built into the process so that programs have time to review the changes and come into compliance by June 1, 2015. You can find the new regulations online at http://ocfs.ny.gov/main/childcare/default.asp. If you are a Family Day Care or Group Family Day Care Provider, take advantage of this free training and earn credit! • The Office of Children and Family Services-Division of Child Care Services (OCFS-DCCS) developed regulations for serving healthy beverages in child care. • This training is available to help you and other providers learn the regulation and how to follow them in your child care program. • The 45 minute training is available on demand. • All you need to do is view the training presentation, answer the quiz questions and receive your certificate of training. • Show your certificate of training to your licensor so they know you are aware of the regulation. As child care providers one of your many responsibilities is to stay abreast of infectious diseases that pose a possible risk to the children and families in your care. You may have noticed on national news outlets that there has been an outbreak of Enterovirus D68 or EV-D68 which has caused a significant number of children to become ill some requiring treatment in the hospital and for some in intensive care units. As of this date, the virus has been reported in 21 states, including New York. One of the reasons this virus is so concerning is that it spreads similar to the common cold and the symptoms start like the common cold, but for some children it progresses very rapidly to severe difficulty breathing. The majority of children experiencing severe illness are those with underlying respiratory illness such as asthma or a history of wheezing, but not all. Interestingly, very few of the children hospitalized with the severe respiratory symptoms had fevers. 1) Update the children’s emergency contact information and ‘permission to treat’ and discuss emergency plans with families. 2) Establish written ‘emergency action plans’ for children with asthma or other respiratory illness so you know how to respond in a breathing emergency. Children with a history of wheezing or breathing difficulties appear to be at highest risk. 3) Establish and practice excellent infection control practices. One that is frequently overlooked is handwashing whenever anyone enters your program. 4) Review your daily health check procedures and exclusion criteria with parents. When frightening new illnesses are in the news, it is important to focus on the areas that we have control over and that can make a difference in preventing illness and in responding appropriately should a child become seriously ill.
Rochester Medical Center’s Environmental Health Sciences Center. Blossom Road in Rochester, N.Y. Free parking is available across the street. child care, and it urged the state Senate to pass it as well. subsidies and providing greater opportunities for child care provider training. learning for children up to the age of five. $11 million annual investment in child care subsidies. between workgroup members, parents, child care professionals and advocates. and small day care center proposed regulations. The public comment period will end at 5PM on March 17, 2014. A Reggio Emilia Inspired Conference for educators working with children birth through age 8 on March 21, 2014. A follow up “Continuing the Conversation” session will be held on Saturday, April 5th. Click here for details and registration forms. Recycle Shop will have a new look! The Recycle Shop (Rochester location only) will be closed until the end of the year for rearrangement. Shopping will be by appointment only until the end of the year, call 585-654-1190. Posted in Community Resources, For Parents, For Providers, News | Comments Off on Recycle Shop will have a new look! Our agency has proudly achieved National Quality Assurance! Fifteen New York CCR&Rs have joined 11 other CCR&Rs as Child Care Aware® of America Quality Assured, a national certification earned by CCR&Rs that demonstrate their administrative functions for core competencies and their services to parents and providers meet national best practices. Posted in About Us, For Parents, For Providers, News | Comments Off on Our agency has proudly achieved National Quality Assurance! Keep your kids safe. Get their seasonal flu vaccines every year! Schools and child-care settings are required to post influenza educational material, in plain view, within their facilities. Information should be posted starting now. Influenza season begins in early fall and can last through May. Along with this announcement you will find the Seasonal Flu Guide for Parents. You can download it here: SeasonalFluParentguide. Posted in Community Resources, For Parents, For Providers, News, Uncategorized | Comments Off on Keep your kids safe. Get their seasonal flu vaccines every year! Clean and Healthy New York, Inc. and Child Care Council, Inc. announced today the next phase of their U.S. Environmental Protection Agency-funded program to help child care providers in the Great Lakes Basin identify, remove, and find safer solutions for toxic chemicals in common household and child care products. curriculum, but are customized to address New York State laws and regulations and focus on reducing specific chemicals that threaten the Great Lakes watershed. Click EPA-EcoHealthy Release Aug 2013 for the press release that includes dates and contact information.  M, T, Th., F: 9 a.m. to 5 p.m.
 Wed. (starting July 10): 9 a.m. to 7 p.m.
 Sat., July 13: 10:30 a.m. to 12:30 p.m.
 Sat., July 20: 9 a.m. to 5 p.m.
NYS Family/Group Regulation Changes are Coming! Public Comment period begins on June 26th, 2013. Join us for a FREE regulations class where we will discuss these changes and give you the opportunity to share your opinions with Albany. Register today by calling Yolanda at 585-654-4798. Posted in For Providers, News | Comments Off on NYS Family/Group Regulation Changes are Coming! Child Care Council is requesting applications for the job title: Nutritionist, Eat Well Play Hard in Child Care Setting. The position is available as of August 1, 2013. The perfect candidate would have : experience providing nutrition education to children (birth to 12 years) and adults; ability to role model and motivate others to make healthy choices in nutrition and strive for a physically active lifestyle; attention to detail with excellent verbal and written communication skills; proficient computer skills; reliable vehicle and driving record; willingness to travel within a 6-county region all year long; self-motivation; ability to take initiative; and comfortable meeting and working with new people. NAFCC is holding their annual conference in Scottsdale, Arizona, July 18-20, 2013. This annual conference is the only national conference in the United States dedicated exclusively to those who provide family child care and those who support family child care through training and technical assistance. For more information and to register, visit www.nafcc.org. The Office of Children and Family Services (OCFS) will hold three public hearings on New York State’s proposed two-year plan to receive assistance under the Social Security Act and the Child Care and Development Block Grant Act of 1990, also known as the Child Care and Development Fund. The state’s proposed plan will cover the period of 10/1/13-9/30/15. The purpose of this federal block grant program is to increase the availability, affordability and quality of child care services. Federal funds would be available to assist New York State in supporting subsidies for child day care services to low-income families upon the plan’s approval by the United States Department of Health and Human Services. Funding also would be available for improving the quality of child day care services and increasing the availability of early childhood development programs, as well as before- and after-school services. Persons interested in providing oral testimony during the public hearings must register their intent to do so five days prior to the public hearing with the Division of Child Care Services, Office of Children and Family Services, 52 Washington Street, Room 309 South, Rensselaer, NY 12144. People can also register by calling (518) 474-9454, or by submitting the registration form posted on the OCFS website: www.ocfs.state.ny.us/main/CCDFStatePlan. Oral testimony is limited to ten minutes in length and must be followed up with written testimony within five days after the hearing. Persons interested only in submitting written comments must mail such comments within five days after the public hearing to the Division of Child Care Services, attention Kimmarie Slade, at the address above. Place: Child Care Council, Inc.
Click CCC – OCFS Hearing release for the press release. Celebrate Earth Day by visiting our recycle shop! Genesee Valley Parent magazine published a great article about our recycle shop! The month of April features the 43rd annual Earth Day celebration on April 22. To read the article, click here. Posted in About Us, Community Resources, For Parents, For Providers, News | Comments Off on Celebrate Earth Day by visiting our recycle shop! Cameras & Kids 2013 is here! Cameras & Kids 2013 is running December 10th 2012 to April 30th 2013. Posted in About Us, Community Resources, For Parents, For Providers, News | Comments Off on Cameras & Kids 2013 is here! Center, 595 Blossom Road, Rochester, N.Y.
Click playground conference 2013 for the flyer. Course Registration Form Outdoor Play. Child Care Council Inc. has partnered with the American Lung Association of New York to develop a pilot project directed at creating the safest environment for children with asthma to receive care. To begin the process of becoming endorsed, attend one of the Asthma 101 trainings, then self-complete the Asthma Friendly Child Care Endorsement Guide. Child Care Council’s Registered Nurses will guide you through the process of becoming an Asthma Friendly endorsed child care program. Child Care Council is hosting a series of workshops called Family Talk in January! relationships, substance use and HIY. positive ways to convey values to children. they mature sexually through puberty. • Information about substance use. Posted in About Us, Community Resources, For Parents, News | Comments Off on Child Care Council is hosting a series of workshops called Family Talk in January! Are you ready for the new crib guidelines? Beginning December 28, 2012, any crib provided by child care facilities and family child care homes must meet new and improved federal safety standards. The new standards took effect for manufacturers, retailers, importers and distributors on June 28, 2011, addressing deadly hazards previously seen with traditional drop-side rails. Standards now require more durable hardware and parts and mandating more rigorous testing. Go to the following websites to get more information and a flyer for your program. Posted in Community Resources, For Parents, For Providers, News | Comments Off on Are you ready for the new crib guidelines? ROCHESTER, N.Y., Sept. 20, 2012 – Child Care Council Inc. has been awarded four contracts from New York state to provide services that enhance child care and early childhood education programs. Under the five-year contracts, which are funded by the New York State Office of Children and Family Services, Child Care Council will continue to serve as the Rochester Region Infant/Toddler Resource Center and to provide child care resource and referral services in Monroe, Livingston and Wayne counties. The Infant/Toddler Resource Center provides services designed to enhance programs for the care and education of infants and toddlers. Services include ongoing education, technical assistance and support for early childhood educators, licensors, registrars, enrollers, child care centers, family and group family child care homes, and legally exempt child care providers. The Council will continue to provide an infant toddler specialist in every child care resource and referral agency within the nine counties of Chemung, Livingston, Ontario, Monroe, Schuyler, Seneca, Steuben, Wayne and Yates. The three child care resource and referral service contracts enable Child Care Council to provide comprehensive services focused on the support of high-quality child care programs that promote safety, permanency and well-being for children, families and communities. Services include child care referrals and education for families seeking out-of-home care for young children, technical assistance, business start-up and continued education, health consultation, enrollment and support for legally exempt child care providers. Saturday, February 23rd, 10 a.m. – 4 p.m.
Sunday, February 24th, 10 a.m. – 4 p.m.
(Use the side door (and ramp) that faces Blossom). Childcare center used toys and furnishings. Please be prepared to take items at time of sale.